The social and cultural history of the village of Monivea, in Co. Galway, can be taken to reflect the changing fortunes of the nation at large. To follow the lives of those who lived in and around this settlement will help to explain the strong character of our people and their loyalty to the vibrant Gaelic culture. Monivea has been, for most of its history, a small outpost of colonial control - surrounded by a thriving Gaelic society. With an identity all its own, the village to this day strives, with characteristic commitment and verve, to face and conquer the spread of conformity. Here, we shall take a brief look at how the character of the people has been moulded down the years, noting (a) the origins of and current hopes for the village and (b) the lives and times of the Landlords – the Frenches – going back to Norman times. The village of Monivea in County Galway, in the West of Ireland, has been a leader in innovation since the 18th century. This sense of innovation and the will to excel has its roots in a long and hard history which formed and strengthened the character of the people. The village owes its existence to the efforts a local landlord, Robert French, to develop his estate. It was his dream that it would be possible to establish an economically viable community even in a rural location with seemingly no natural advantage. When the village was built, the European ‘Enlightenment’ movement was at its height. This reflected a popular (perhaps shallow) fascination with the new frontiers which science was opening up at that time. Well-to-do people busied themselves with fresh ideas. They believed problems could be solved with clear-headed thinking. In its beautiful rural surroundings, Monivea has prospered for 250 years. It has remained true to the vision of its founder, always trying new initiatives to find the right niche in the economics of the day. The linen industry grew strong and then waned. A service industry for the Bianconi Coach Routes was another venture. It came to an end when trains took over. More recently in the nineteen-seventies, Monivea had again to find a raison d’etre. The philosophy of the Rural Housing Organisation was adopted and, with the construction of affordable housing, new people were attracted to the area. Both old and new settlers now form the modern village. In today’s rapidly changing times, a fresh application of the old formula is needed. If nothing were done, the likelihood is that the village would become a dormitory town for people working in Galway City. Such development, as evidenced in the rest of the country, would pay no respect for spatial planning and the economic use of land. A scarce resource would be squandered with vast settlements of low-density housing. This would inflict a lasting social cost, as well as a cost in energy-efficiency, with an associated economic penalty. In addition, the special landscape around Monivea would be blighted. There is a strong sense of community in the locality. If there is to be growth then it should respect the qualities and values of self-sufficiency, characteristics of an Enlightenment village. In 1998, the Monivea Community Development Co-operative Society Ltd began to prepare the ground for expansion by commissioning a study entitled ‘Monivea Tourism - Partnership Potential’. As a result of this, constructions of historical note were renovated. The old was delicately blended with the new to allow for modern development in tune with the founding principles. From olden times, the ice-plant, for example, is a magnificent monument to mediaeval engineering (it is a year-round refrigerator). A centre-piece will be the restored tower of a church of the Established Church (as the Anglican Church in Ireland is still sometimes fondly called), whose people have done so much for the area. The next project of the people in Monivea is designed to allow the village to retain its atmosphere and way of life and to achieve a new sustainability. The logic is compelling and focuses on the restoration and retrieval of the French demesne, now fallen into disrepair, and on the construction of a beautifully designed retirement sanctuary for ‘elderly gentlefolk’. Thus a special rôle will, with some good fortune, be assured for the resilient community of this village for many years to come. The French/ffrench family were extraordinary and exuberant people. It is a wonder what kept them in Monivea, through such troubled times as were witnessed. Ireland had forged a new identity when the Normans had settled amongst us. They gained what they really wanted - a place to live. We, in turn, learned from their technology. They shared our religion and soon they came to share our language and culture. They became hiberniores Hibernibus ipsis - more Irish than the Irish themselves. This peace amongst peoples was shattered when the Saxons reasserted themselves in England. They began to leave their island fortress, not for adventure, but to conquer and subjugate. We had not developed into a warlike nation. We were more interested in honour and learning. We had earned the name of the Island of Saints and Scholars and had a highly developed legal system (which was founded on democratic principle and accorded much respect to the role of women). (See 'A Guide to Early Irish Law' - Prof. F Kelly, DIAS.) We could not successfully face force with force. The Gaelic Order was systematically and progressively dismantled from the time of Henry VIII. It was against this background that a wealthy Galway merchant of Norman descent, Patrick Fitzrobert French, purchased Monivea castle and estate in 1609 from John Crosach O'Kelly. This latter wanted to cut short the slow and humiliating process of dispossession. In 1744, Patrick French was succeeded by his son Robert. All was not always idyllic on Monivea estate. Local famines in 1727, 1730 and 1740-41 led to the death by starvation and disease of the inhabitants of several villages. Colonial policy, intent on destroying the old Irish economy, did not intervene. Bodies of dead and dying people lay strewn in the fields. Robert French (quite atypically of his class) changed sides and joined ranks with the Protestant landlords - the English establishment in Ireland. He even espoused the cult of Rationalism, common in France at this time. If the Gaelic chiefs had in general imposed taxes on their people under English law, they might, just possibly, have survived. But they could not colonise their own people. In Gaelic culture, the chief was elected from amongst the people and had no absolute powers or ‘divine rights’. At the time of Elizabeth I, Galway was a prosperous city state whose burgers acted as middlemen between a diminished Gaelic Ireland and the world outside. They traded in wool and wine, became their own bankers and eventually incorporated a guild of merchants. After the revocation of the Edict of Nantes, many Huguenots fled France and settled in Ireland to continue with their linen industry. In 1746, Robert French, in order to turn the family fortunes around, turned his attention to the manufacture of linen. But he needed workers. In 1733, the Incorporated Society for the Promotion of English Protestant Schools in Ireland was established to give an industrial education to poor Catholic children and rear them as Protestants. In 1749, Robert French provided land to a schoolmaster of the Incorporated Society to take in and educate poor children and 'to teach the English tongue - for ever'. In 1788, the condition of these poor Catholic children, wrested from their homes to be schooled, was brought to public attention in a report which said: "There were twenty-two children, most of them two to four years of age, in a very sickly condition, having the itch, scald head, sore eyes, some lay grovelling in the turf ashes." French had also brought trained linen workers to his estate, mainly Protestant weavers from around Belfast. Monivea became a village of English-speaking Protestants in a Gaelic and Catholic sea. The population of settled Protestant cottiers, however, did not thrive. As time passed, the fortunes of Monivea began to change. Robert French died in 1779 and his son and heir, Acheson, also passed away in that year. In the wider world, republican ideas were beginning to be heard and enlightened Protestant opinion was beginning to conclude that the large Catholic population must be reconciled with, in some way, rather than eliminated. But the Irish still wanted their sense of nationhood. The failed and bloody rebellion of 1798 brought about the Act of Union between Ireland and England in 1800. This shifted the social focus of the landed gentry to London, reducing the status of the settled Anglo-Irish Protestant ascendancy to a degree. In 1802, a party of the Frenches embarked on the Grand Tour. They had become Romantics, having forsaken the Rationalism of the great Robert French. And romantic they must have been to go off to Europe during the Napoleonic wars. The family was called French but they certainly were not French. Around this time they made this clear by changing their name to 'ffrench'. 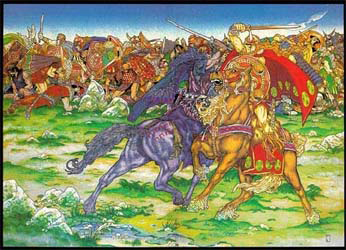 Back in Monivea, the Gael were (once again) clawing back their fortunes and their population was rapidly expanding. Catholic Emancipation followed, under the direction of the great Catholic Lawyer, Daniel O'Connell. This occasioned the building of many new churches near Monivea. Two of these centres of worship had to be abandoned. Reports were carried that Protestant visitors at the Castle were being entertained with revelry of an unspecified and unacceptable nature in these consecrated places. Economic activity had prospered up to the end of the Napoleonic wars when trade liberalisation brought hardship to some. Of the eight million people who lived in Ireland up to the middle 1800s, some three million lived almost exclusively on a diet of potatoes. The potato was nutritious, reliable and gave a good yield even in poor soils. The ruling orders in England took the view that, for very little work, the lazy Irish were availing of far too handsome a diet. The need to pay rent was not taken into account, a need which bound the people as serfs working for 8d per day - in order to make up over £5 to pay for just enough land to keep a family from starvation. Very little folklore comes to us from Famine times. The urge to forget must have been very strong. It is perhaps Irish Americans who have most kept alive stories of the desperate struggles of their forefathers. How they raised the money to go to the New World (an tOileán Úr, in Irish), how they avoided robbery by unscrupulous shipping agents and succeeded in boarding a ‘coffin ship’, how they cheated death on the voyage. Stories of heroism against all odds. The great Famine hit Monivea in 1846. In the neighbouring parish of Abbeyknockmoy, the parish priest noted in 1847 that of one thousand families, fifty would have enough food until the 1848 harvest. One-third of the people could not attend Mass for want of clothing and few had night coverings. It was common for the priest to find everybody in a house dying or dead when he called. It was recorded on one occasion that a starving child was eaten by a dog. Schemes of Famine relief were ineffective. The workhouses did not provide sanctuary. Yet they were filled to overflowing. People gathered there simply to die of starvation, disease or both. The rules required that a man could be sentenced to the punishment cell for showing such affection for his wife as to embrace her. He forfeited his holding if it exceeded one-quarter of an acre. Thus many wretched families were deprived of their means of support, if perchance they were able to leave. The Protestant landlords owned crops other than potatoes. Sharing food with the native Irish was not a practice. The Chief Secretary of the English Treasury, at this time, introduced a new system of relief. Landlords were to be allowed to provide assistance for the destitute by increasing the levies on other tenants. Irish capital was to pay for Irish poverty. Landlords were largely unconcerned about their poorer tenants and there would have been little or no ‘Irish capital’ to extract anyway. The people simply died or were evicted wholesale from the estates, to live or die by the roadside. There was a saying amongst the dying: “Better to walk than run, better to stand than walk, better to sit than stand, better to lie down than sit.” The motivation for indifference by the English as we starved, especially during a time of no physical conflict, has not yet been properly examined by academics. Indeed, the trait in question would appear to exist in all humanity. It cannot be claimed, with any integrity, that one race or another is particularly so inclined. The truth about inflicted deaths will never be confronted, understood and handled whilst history is written to follow an agenda. As the population plummeted from eight to something over three million, the Irish clung to their dignity with more tenacity than they clung to life itself. What a sad remnant of the magnificent warrior race which had come to this island! Of the people had set up one of the greatest civilisations that Europe had produced, whose Saints and Scholars had nurtured Europe in its time of want after the Dark Ages. Farms in the uplands were abandoned and never tilled again. All over the country, one can see the ridges from which the last crop never grew and the ruined botháns - the miserable cabins in which the poor had lived - in the horrible subjugation of everything they stood for. The Irish language went into rapid decline. The abandonment of the language was by conscious decision. Even more than the pain of the Famine, memories of the surrendering of our most unique cultural possession were everywhere suppressed beyond recall. A culture of mixed origins and with very different values and traditions was taken on. Even today, this final act of subjugation is hardly recognized, nor the fact that we changed as a race when we effectively lost what we had cherished and nurtured from the dawn of our history. It would be very wrong to assume that the Flame of Gaelic Ireland ever died. 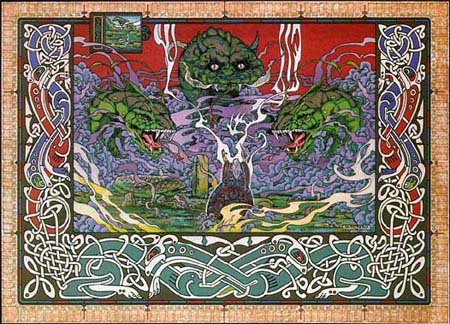 The Cladhamh Solais (the Sword of Light of the Celtic god Nuada) only rests in its sheath. With our growing achievements once more proclaiming the Irish spirit, the possibility of revitalising our Gaelic identity would return to us an enthusiasm which nothing else could equal. In any event, the ffrenches continued to hold sway in the Big House at Monavea. But the winds of change were coming when the last of the line, Robert Percy ffrench, took over in 1876. He followed a high-flying career with the British Foreign Service. He married the daughter of a Russian landowner. She was an Orthodox Catholic and of great wealth. He converted to her Faith, bringing the family back to Catholicism. He eventually became a Knight of St John of Jerusalem. Robert Percy ffrench died in Naples in 1896. The mausoleum at Monivea was built to receive his remains. This architectural gem is one of the proudest possessions of Monivea. It is a magnificent building, which connects the village to the outside world. A connection which, in the hands of the present inhabitants of the village, is going to be remade and strengthened. An Enlightenment Village it was. An Enlightenment Village it will ever be.